BARGES: All about barges and barging - building, buying, maintaining, equipment, handling on the water, etc. since we are kind of evolving more to 'the loop' and 'marina's'. I am throwing some more .. Yes we looked to doing the loop, and when we bought the US based boat, we actually made it part of our selection process. Now remember we are on the Ohio rive, which is 2 - 3 times as wide as the Rhine river, and if you gather all the commercial traffic in a year, you MIGHT come close to one hour of barge traffic on the Rhine. Yes when we bought the boat we had NO idea of the transient cost for boaters. Having done a few trips. ( out of the marina you can only of starboard or port and after 300 - 500 km come back the same way ) we found out it would have been cheaper to get a hotel including meal than just moor in a Marina! No fun municipal moorings like some in France, where you are greeted with coins for the shower and "no yo do not need to pay here, please let me arrange a visit to our nuclear power station". ( Lateral de Loire). To yes I will ask for the 7 Euro's after you had lunch in the cafe. At the same time a 'normal time 'to do the loop is about a year, many large parts are so boring, even some auto pilots asked for a gun to shoot themselves. I am not sure about the gun problem, but with over 130 mass shootings alone this year, it is definitely something to keep in mind, the gun culture her. I am not so worried about the lakes. Hell if my granddad crossed the Channel in his westlander in 1940, I can manage the lakes when I do not have a time constraint..
Actually I live on the East Coast of the USA and have done the eastern part of the great loop several times. It is an easy waterway, interesting and worthwhile with lots of places to stop and visit. I will do some of the Northern section this year up into the Erie Canal and the Great Lakes. Apart from the Mississippi, the facilities are generally very good and I have had no problem finding anchorages or marina facilities (with planning ahead) for a 60ft vessel. I agree that the open water sections would be a challenge so it would be important to pick a good weather day for the 'hop' from Virginia to NJ and NJ into the Hudson River.I have some experience of Dutch Barges in the UK and thought it would also be a good vessel for the US waterways but I have never seen any here although, based on the feedback here, there are clearly some around. I suppose it's the engine/propeller setup and the hull form that might need to be adapted in order to improve the performance on these waterways as the open water sections are sizable and even the lakes and Sounds can behave like oceans as they are so big and deep in places. Anyway, thanks for the input....food for thought. There is a great loop society with a web site that give lots of good info to none members. When we looked at it, we were put of by 1. The la ck of facilities for more than 50ft boats. 2. The very long distances between ports, especially on the mississipi. 3. One stream on their forum concerning the choice of gun. Though otherwise a great idea. Terry Darlington ,along with his wife and “narrow dog” did the Norfolk to Florida part in a classic British narrow boat and wrote a book about it. Mind you I think he was nuts, but a barge has advantages galore over a narrow boat! I can’t remember the exact title of the book but look under Darlington and Narrow Dog and it will arise. I agree with Lon. I’ve done the full Intracoastal a few times in a sailboat. Norfolk to Miami would be fine in a barge. North of Norfolk would be problematical, with open water ocean segments. The greater impediment would be the expense. I’d hate to pay five dollars a foot for a night at an ICW marina for my 21 meter luxemotor, if I could even find space. A Dutch barge on US canals is a nice thought experiment but its just the wrong place for one. Dale, I can respond to your question as having experience on the ICW, but not with a Dutch barge. I do currently have a Dutch barge in France and can refer to my experiences there to how the barge would work on the ICW. As for the ICW, I lived on a 42 ft trawler on the ICW and traveled over 6,000 miles doing the Great Loop via the ICW, Inland Rivers, Great Lakes, Gulf of Mexico, and Atlantic Ocean. As Jan mentioned, I also think the barge would work great on the rivers and most of the ICW, however, the rest of the bodies of water to do the Loop would be a greater challenge. Similar to the challenge of bringing a barge across the channel from the UK to Europe. A lot of open water that takes planning and good weather windows to cross. I don't think support for the barge would be a problem. Majority of the commerical boats are steel and shipyards are plentiful here in FL and along the ICW and rivers in the major towns. If you were thinking of the Loop, you would not find many marinas to go into and would have to be prepared to anchor out alot. If you want to give it try in the US, there are some hire barges on the Erie Canal, a little pricey, but may be worth the experience. I do recall it being for sale a few years ago. ( 6-7 or so )..for $795,000 ! A dutch barge would be ideal for the ICW and the loop but finding qualified support people.....Steel people...etc might be challenging, since everybody is geared towards Glass fiber and Aluminium ..Perhaps easier along the ICW, than here on the Ohio river. The link to the story you mentioned doesn't work - can you check please? And a bit of googling comes up with this story of 'Dragonfly' a solar/electric barge - looks like a sort of wide-beam narrow boat, that took the trip. ps - you can just click on the 'thank you' button Dale, saves pages and also adds a count to the posters ''thank you" statistics. Thank you very much for your prompt reply.....I shall read it with interest. Welcome to the Forums! Hope you find them useful. I remembered that there was an article on this very subject in the Blue Flag. It featured on the cover! Picture attached. You can download any one of all the back issues from the menu Publications>Back Copies and the issue is #99. Or use this link . 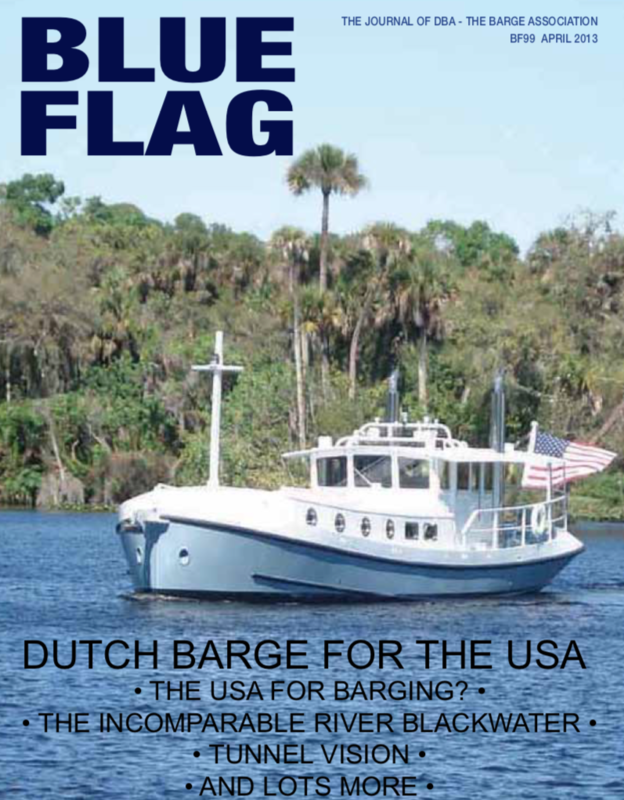 Does anyone have any experience of operating a Dutch Barge on the inland waterway fo the USA. It seems to me that the IntraCoastal Waterway would be ideal for the larger barges but I'd be interested to hear from anyone with any direct knowledge.